Buchanan sectional terminal blocks. 800 Series. 1/O heavy duty contact sections. 600v, 9 kv breakdown, 150 amps. 0.75" pitch. Sections snap together. 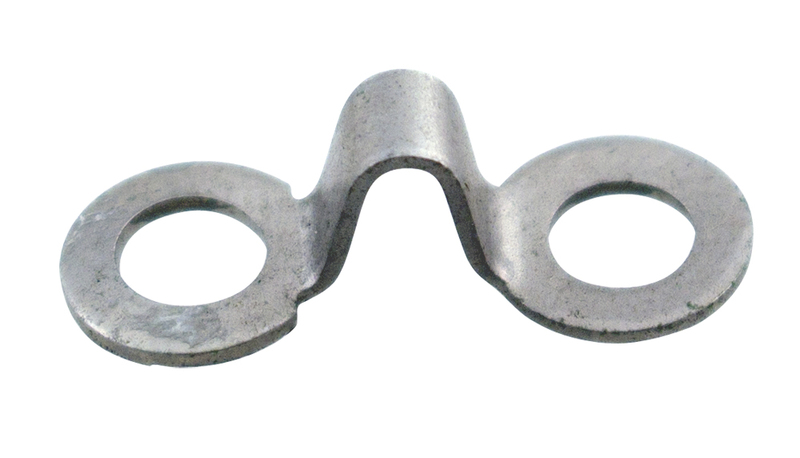 15/16" x 1-3/4" x 1-15/16"H. We do not stock or include channel for mounting. NOTE: 10 sections per box. Barrier terminal strip bridge. Bridge two adjacent positions together. 0.463" c-c mount holes. 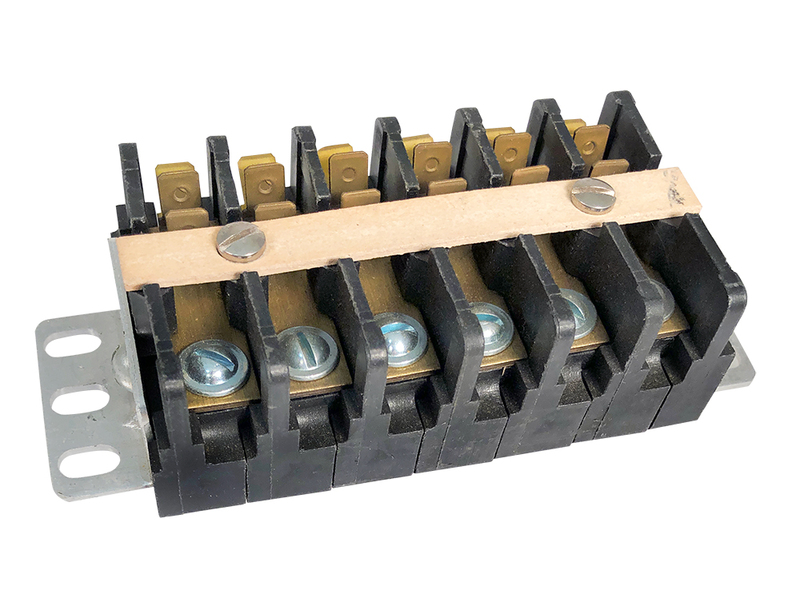 Fits most 15-20 amp barrier terminal strips. 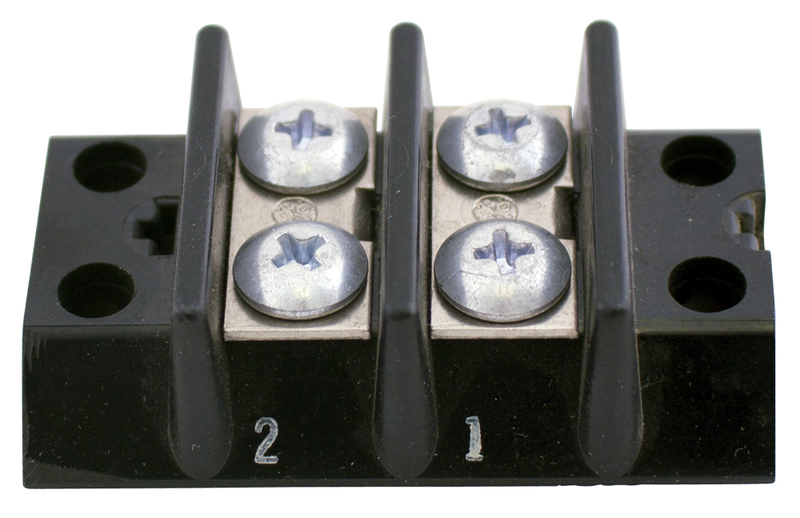 Kulka 601 Series 1 position barrier terminal strip. 20 amp, 300v. 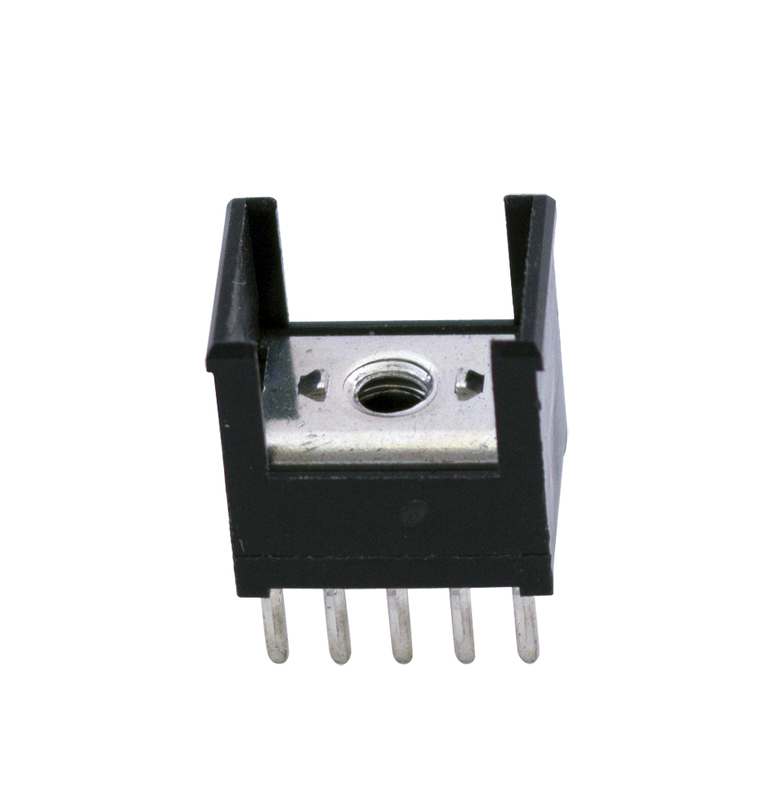 1-1/8"L.
Molex terminal block, wire to wire. 2 position. 12mm pitch. 40 amp, 600v. One center mount screw to mount. Wire sizes: 8 to 20 AWG. 13/16" x 15/16". 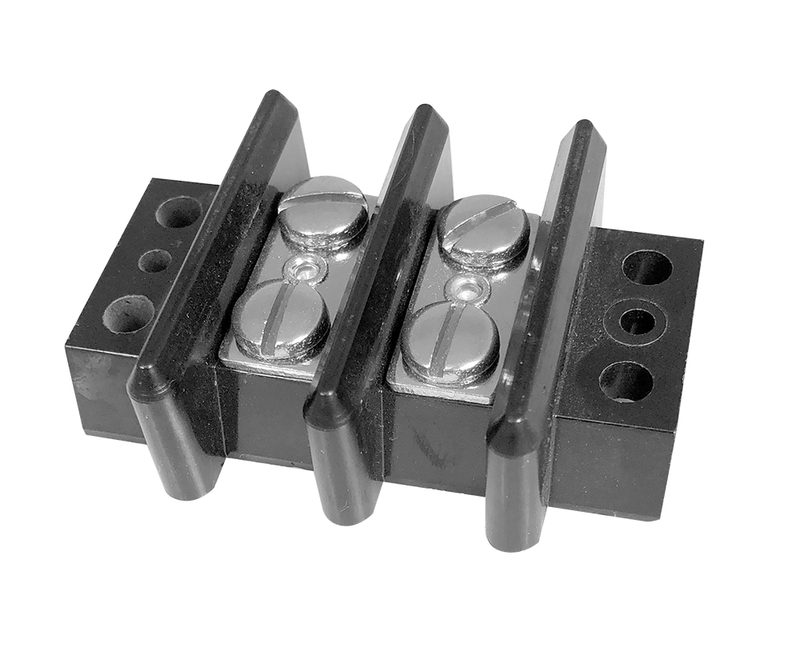 Kulka 603 Series 2 position barrier terminal strip. 50 amp, 600v. 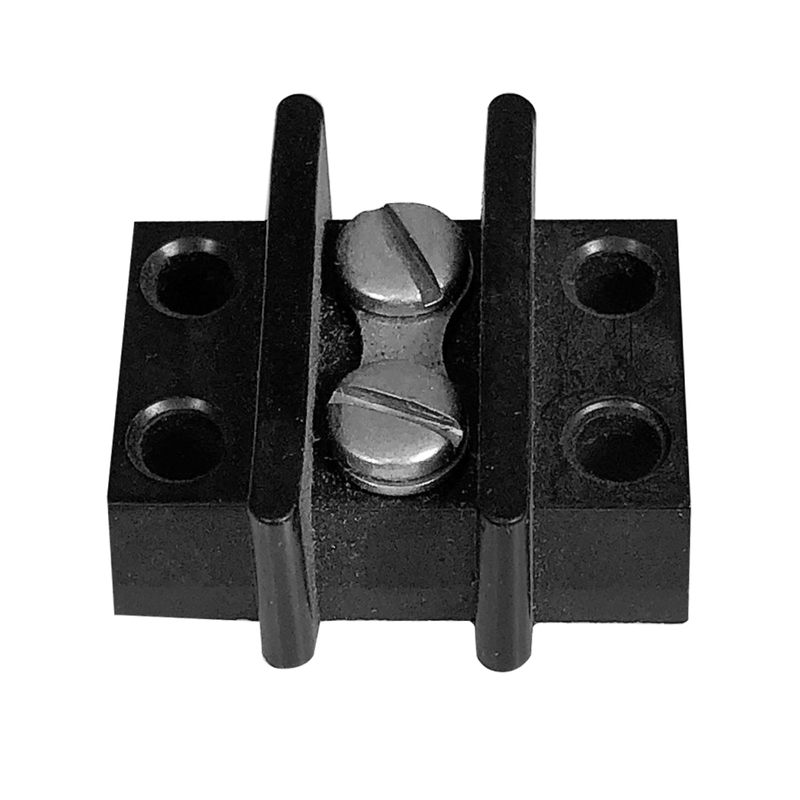 2-1/2"L. Mounting centers: 5/8" x 2". Kulka barrier terminal strip. 2 position, 90 amp, 600v. 1-1/8" center lines. 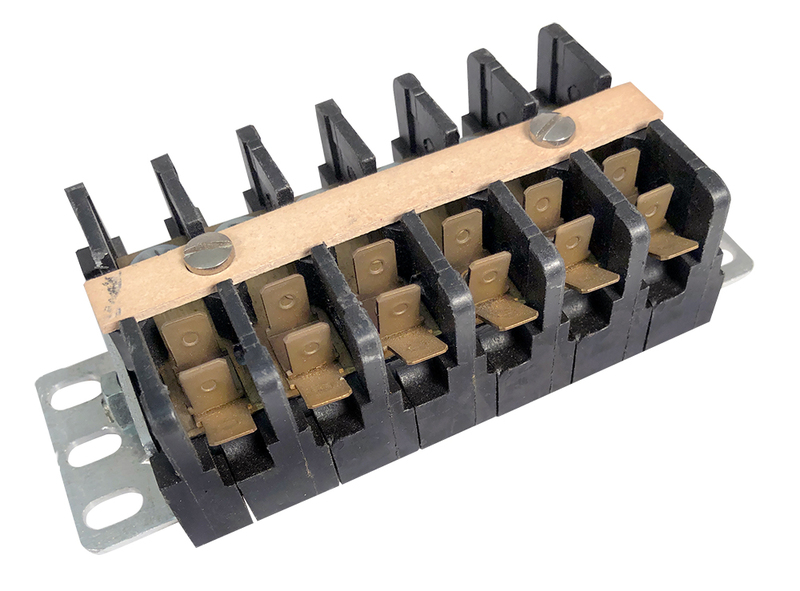 4"L x 2-1/2"W.
GE double row barrier terminal strip. 2 position, 30 amp. Numbered. 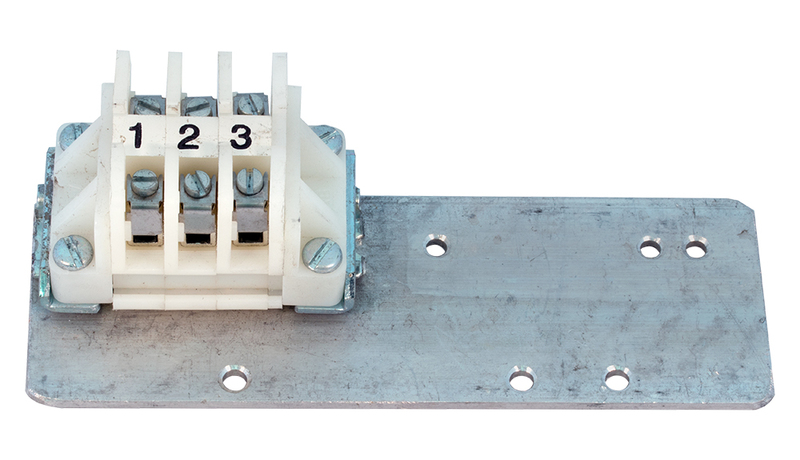 1.36" x 2.71" x 0.63"H.
Din rail barrier terminal strip. 3 position. 20 amp. 1-1/2" x 2-1/2" x 1-3/4"H. Mounted on 2" x 5-7/8" aluminum plate. Removed. Barrier terminal strip. 3 terminal. 40 amp. 3-3/16" x 1-13/16" x 0.655"H. 0.69" pitch. 0.646" x 2.76" mounting centers. 10-24 screws. Kulka/Cinch barrier terminal strip. 3 position double row, 15 amp. Open back. 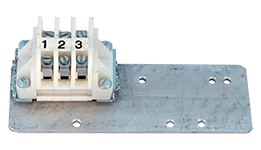 1-3/4"L x 7/8"W x 7/16"H. 3/8" C to C.
Kulka 671 barrier terminal strip. 3 position double row, 20 amp. Closed back. 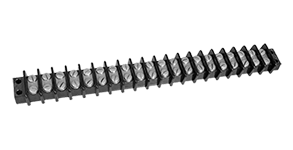 2-1/8"L x 1-1/8"W x 9/16"H. 7/16" C to C. 6/32 screws. 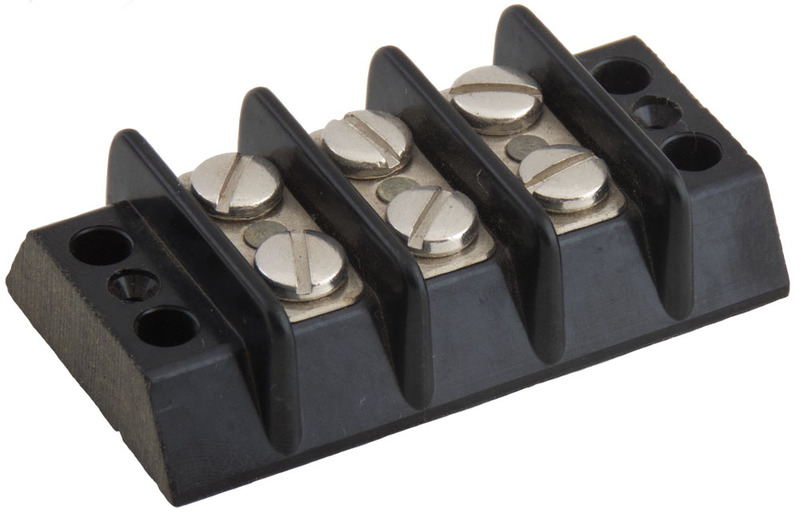 Curtis Industries high current, single pole terminal block. 125 amps / 600 volts. Type "O". 2.88" c-c mounting holes. 2.5" wide x 3.38" overall length x 1.875" high. 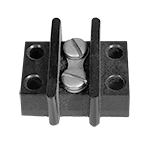 UL recognized for wire up to 1/O. Harris P/N: 586-2007-013. NOTE: Hardware has some rust. Double row barrier terminal strip. 4 position. 15 amp. 2.2"L x 0.875"W x 0.4" high. 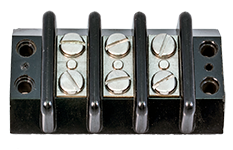 Kulka double row barrier terminal strip. 5 position. 15 amp. 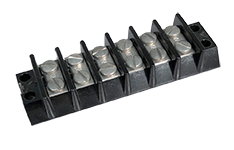 2.55"L x 0.88"W x 0.5"H.
Kulka double row barrier terminal strip. 5 position. 30 amp. 3.8"L x 1.4"W x 0.75"H. NSN: 5940-00-N194-850. 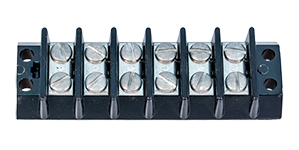 Cinch double row barrier terminal strip. 6 position. 600v. 2-5/8" mounting centers. 2.9"L x 1.14"W x 0.62"H.
Curtis Industries barrier terminal strip. 6 position, 30 amp. Screw terminal + triple 1/4" spade terminal quick connect. 4-7/8" x 2" x 1-1/4"H. 35/64" center to center. Magnum barrier terminal strip. 6 position. 20 amp. 3-5/16"L x 1-1/8"W x 1/2"H. 3-1/16" x 7/16" mounting centers. Curtis terminal block. 6 position. 0.5" c-c spacing. 1/4" QL spades (3) x 8-32 screw (1). 4-7/8" overall length. 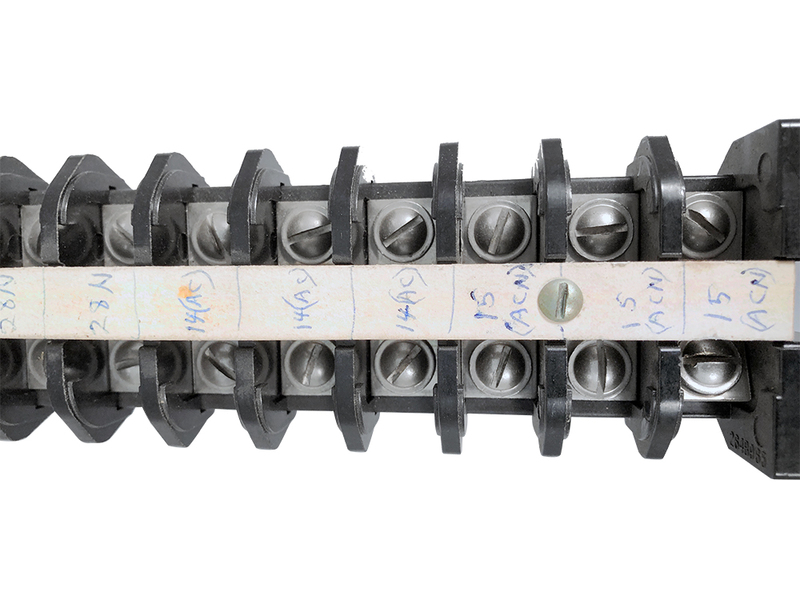 1-15/16"W x 1-1/4"H.
6 position barrier terminal strip. 5 amp. Includes label card. Screws NOT included. Strip measures: 5/8" x 2"L. Card measures: 1-1/8" long. Magnum barrier terminal strip. 6 position. 20 amp. 3-5/16"L x 1-1/8"W. 3-1/8" mounting centers. Heavy duty fanning strip. 8 position. Fits any 20 amp terminal strip. 0.435" centers. 5/8" x 4-1/8" backer. 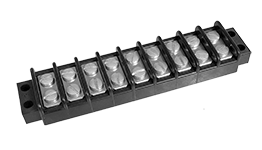 8 position double row barrier terminal strip. 5/8" wide x 2-1/2" long. Sold as pictured without 2-56 screws. Add a set of 16 tiny 2-56 screws for barrier terminal strip (TSL) 410-8B-NH. Beau barrier terminal strip. 7500 Series. 9 position. 20 amp, 300v. 4-11/16"L x 1-1/8"W. 4-3/8" mounting centers. Double row barrier terminal strip. 9 position. Jones. 1-3/8" x 6" x 0.607" high. 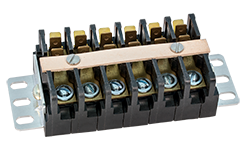 Cinch double row barrier terminal strip. 10 position. 20 amp. 5-1/8" x 1-1/8" x 1/2"H overall. Single barrier terminal through hole. 10 position-DIP. All pins to 6-32 screw. 0.395" x 0.499" x 0.480"H.
Kulka barrier terminal strip. 10 position. 10 amp. 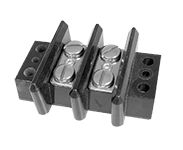 4-3/8"L x 7/8"W. 4-1/8" mounting centers. Curtis barrier terminal strip. 11 position. 40 amp. Center label strip. Dimensions: 2" x 8-1/2" x 1-1/4" high. CSA - UL. Vintage General Electric barrier terminal strip. 12 position. 40 amp. 8-3/16"L x 2"W x 1-3/16"H. Used, removed. Circa 1940's. General Electric barrier terminal strip. 12 positions, numbered. 5-3/16"L x 7/8"W. Screws NOT included. 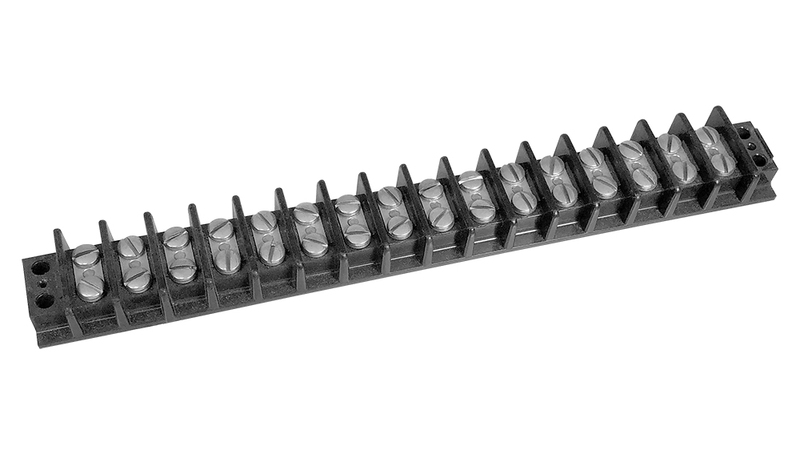 Add a set of 24 screws for above General Electric barrier terminal strip (TSL) CR151D75112AB. 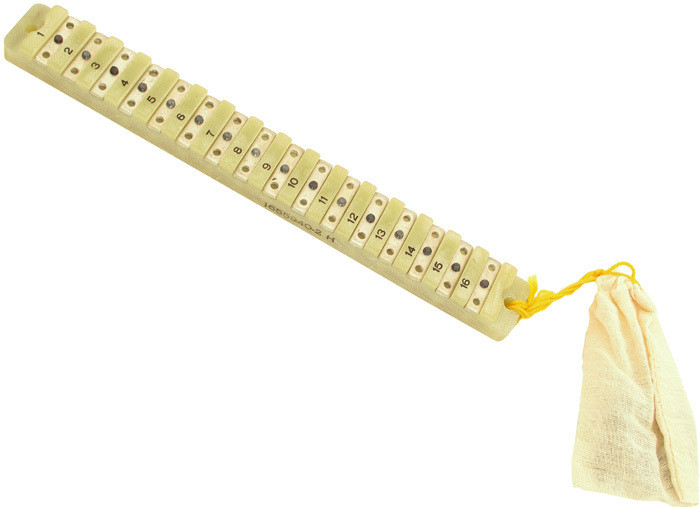 12 position, double row barrier terminal strip. 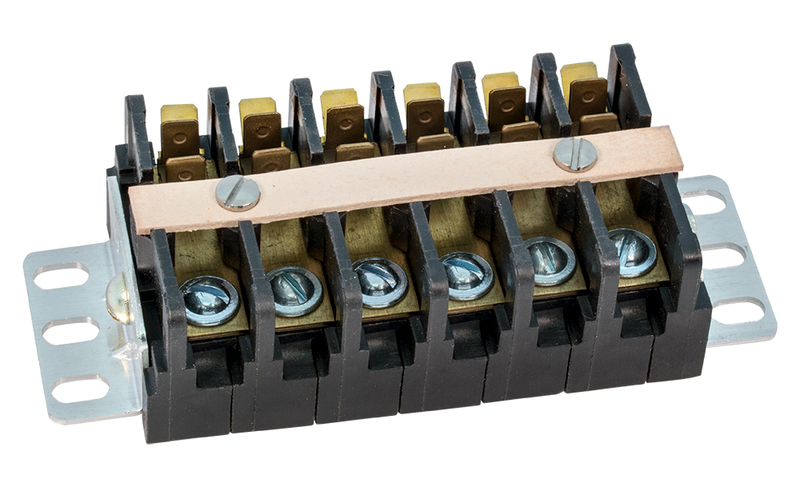 20 amp, 1-1/8" x 6"L.
Kulka vertical feedthru terminal board. 14 position, single row barrier. 40 amp, 600v. Brass barrel nuts, 8/32 threads. 1.186" x 0.621" x 6-1/2" overall. 6" c-c mounting holes, 3/16" dia. NSN: 5940-00-502-8471. 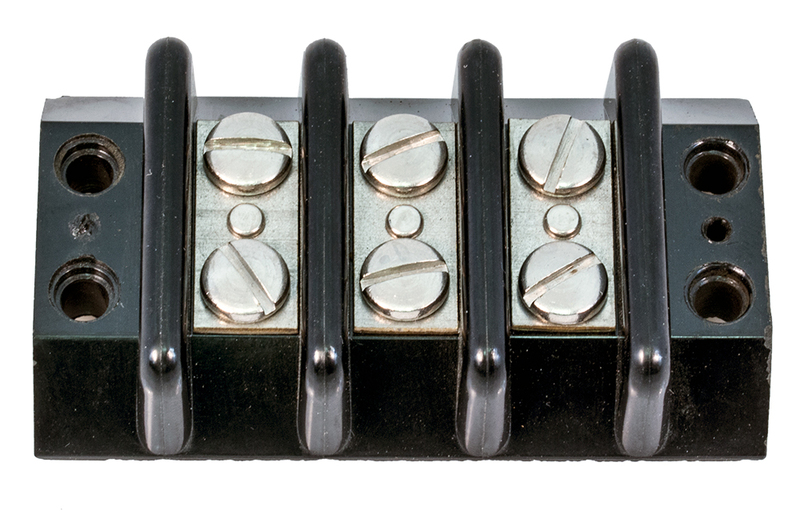 Kulka double row barrier terminal strip. 15 position, 20 amp. Silver / copper hardware. Brown. 7-5/16" x 1-1/8" x 1/2". 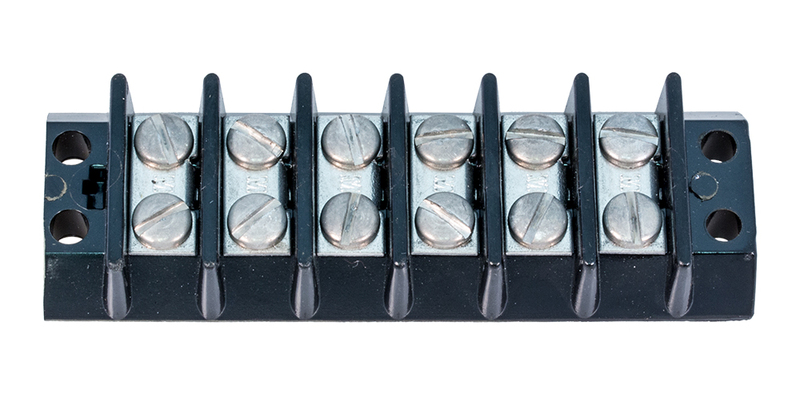 Cinch Jones double row, 11 position, 20 amp. Black. 5-1/2"L x 1-1/8"W x 1/2"H.
Harris Radio Transmitter, Curtis barrier terminal strip. Harris P/N: 614-0437-000. 16 position barrier strip with screws. 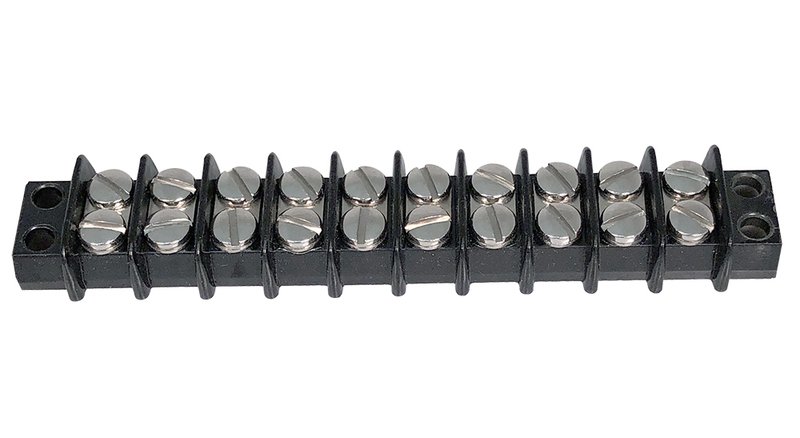 Double screw - 1/2"
16 position (30 screws) double screw barrier terminal strip. 30 amp / 600 volt. 7-3/8" x 1-1/8" wide x 9/16" high. 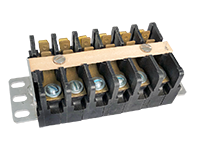 21 position (42 screws) double screw barrier terminal strip. 30 amp / 600 volt. 8-1/2" x 7/8" wide x 1/2" high. Beau barrier terminal strip. 16 position. 30 amp, 600v. 10"L.
Beau 18000 Series barrier terminal strip. 20 position. 20 amp. 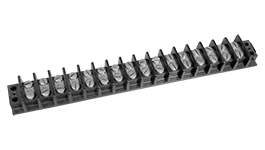 9-1/2"L x 1-1/8"W. 9-1/8" mounting centers. 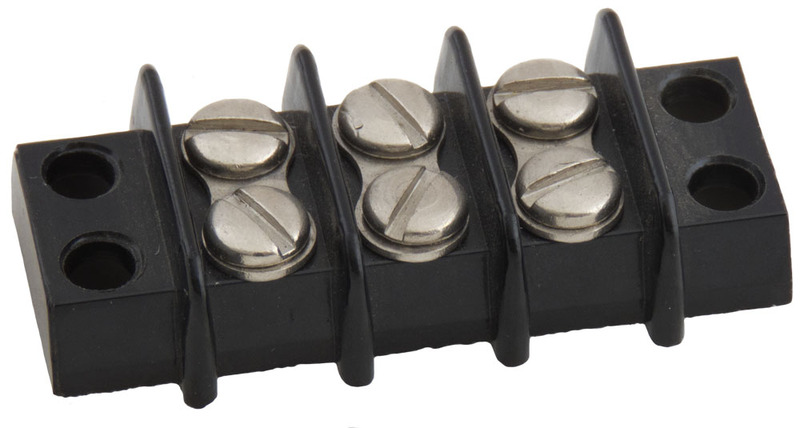 Kulka 20 position barrier terminal strip with right angle fanning strip and two, 4 position shorting strips. Includes terminal position label placard. Used, removed from new equipment. 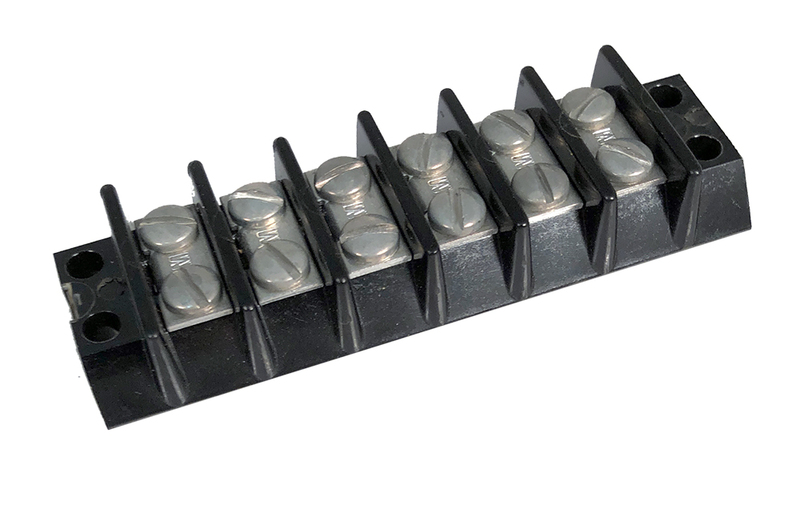 18 position double screw barrier terminal strip. 30 amp, 600v (4kv test), gray military version, MIL-T-55164. 11" x 1-5/16" wide. 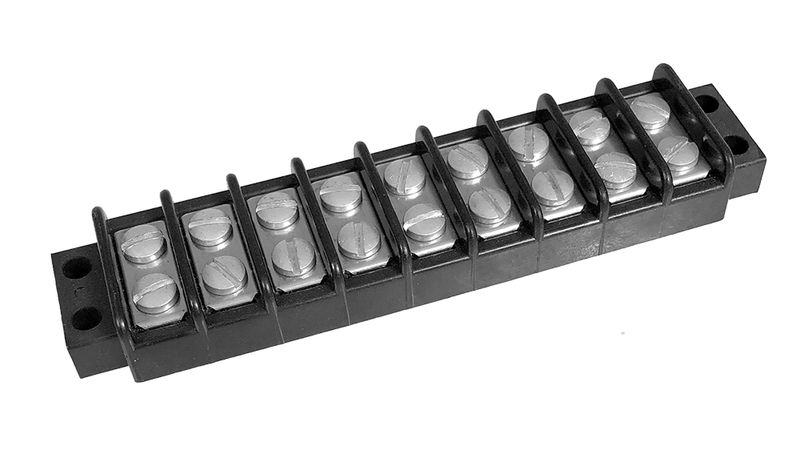 20 position double screw barrier terminal strip. 30 amp, 600v, black. 12-1/4" long x 1-5/16" wide. Kulka 23 position barrier terminal strip with right angle fanning strip. 15 amp, 600v. 9-1/4"L. Used, removed from new equipment. 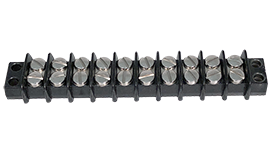 24 position isolated terminals in two rows of twelve. 8-32 bars, posts and nuts. Navy gray. Top quality. 1-7/16" wide x 6-1/2" long x 15/16" high. Barrier terminal strip. 26 position, 15 amp. 10-7/16"L.
Belden barrier terminal strip. 26 position (13 x 2). 15 amp. Shrouded box header with latch. Set of two black wrinkle painted terminal strip label plates with silk screened numbers. First is numbered 5-26, second 27-48, 22 positions each. 10-3/16" long x 1-9/16" wide. Curtis double row barrier terminal strip. Center label. 2 x 26 position. 60 amp. 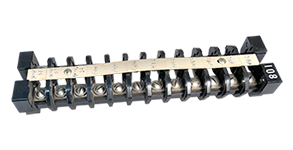 17-1/8" x 2" x 1-1/4" high with brackets, 18-1/2" overall length. Curtis double row barrier terminal strip. Center label. 2 x 30 position. 60 amp. 19-3/4"L x 2"W x 1.05"H, 21-1/4" with brackets.